Permaculture is sustainable, self-sufficient agriculture and gardening – and it’s a central focus of our work at Memel.Global. Those who are employed at Memel Organics are learning how to grow food sustainably, and that knowledge is brought home to enliven their own gardens. 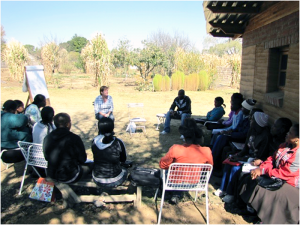 Memel Organics also provides permaculture trainings to other Memel and Zamani residents, including the gardening grannies, as well as visitors from around the region. Residents of Zamani are growing their own food in 100 raised “granny gardens” constructed by Memel Organics staff. Funded by a $50,000 grant from South Africa’s Foundation for Human Rights, the project also installed rainwater catching systems throughout the township. The gardening program supports older women who lived much of their lives under apartheid and who are now raising their grandchildren or great-grandchildren. Many of the children’s parents are working elsewhere or have died from HIV/AIDS. Zamani is blessed with good sun, good soil, and three feet of rain a year – a very easy place for sustainable, self-sufficient gardening. While they still need to purchase cornmeal, meat, and other staples, the women are able to grow many of the vegetables and fruits that make up a good part of a healthy diet, dramatically improving food security for their families. Memel Organics takes special care to harvest and preserve the seed stock. These seeds are used in the Memel Organics CSA and also shared freely with Zamani’s gardening grannies. Over the years, the seed bank has become a massive stock of heirloom seeds – a great resource for individuals now and for the future. Maintaining and building the seed bank is a critical part of food security.